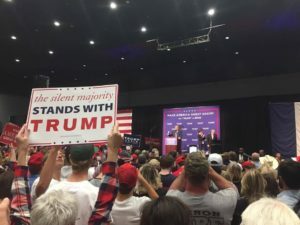 Wearing red ball caps with the slogan “make America great again” and carrying “the silent majority stands with Trump” signs, more than 3,500 people packed into the Sioux City Convention Center Sunday afternoon to see Presidential Candidate Donald Trump speak a mere two days before election day. Sprinkled among the supporters draped in Trump flags and wearing “Hillary for Prison” t-shirts were USD students wearing Coyote gear. Lamberty, who was initially a Rand Paul supporter until after the first debate, said he’ll be voting for Trump on Tuesday. Lamberty said he believes Trump has tapped into an anger that everyday people have against politicians. During his more than 40 minute-long speech, Trump railed against the “dishonest media” and told attendees that his opponent, Democrat and former Secretary of State Hillary Clinton, couldn’t be trusted. He also vowed to build a wall on the Mexican border and bring “law and order” to the United States. “The media and the political elite don’t know the pain and the suffering these people are living under, but I figured it out a long time ago and that’s why I’m here and I’m with you. I was on the other side,” Trump said. Trump ended his speech in Iowa vowing to make the country more prosperous. 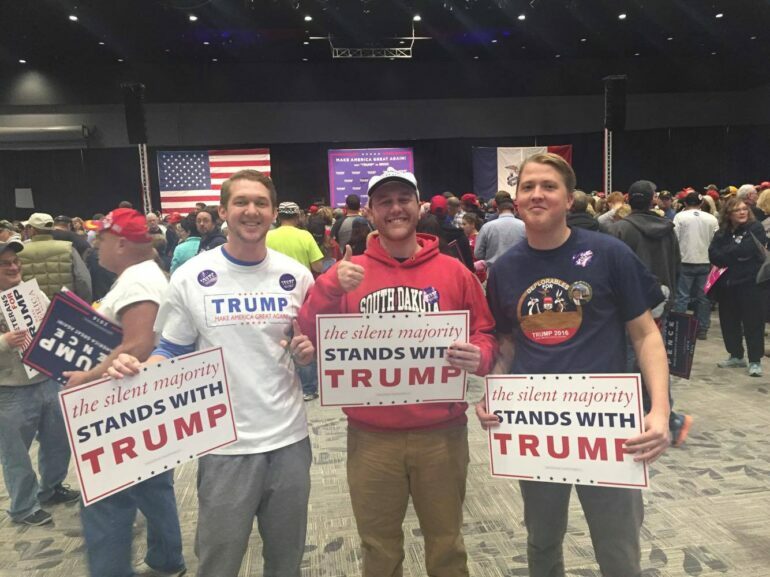 Tyler Reck, a senior criminal justice major who attended the rally, said he early voted for Trump and has supported him since he announced his candidacy. This was the second Trump rally he’s attended. “I like that he likes to support the veterans, he wants more for veterans. 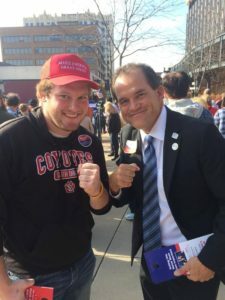 He wants to make the VA better for them, (and) because I have a lot of people in my hometown of Sibley (Iowa) that are veterans so to make the VA better for them would be very beneficial,” Reck said. Reck said he predicts the race will be close. Last month, FBI Director James Comey wrote a letter to Congress saying the agency was again looking into whether a new batch of emails discovered in an investigation might contain classified information related to the former Secretary of State and a private email server that she kept. In a letter to congressional lawmakers Sunday, Comey said the FBI has worked “around the clock to process and review a large number of emails” obtained from a device belonging to Anthony Weiner, the disgraced former congressman and estranged husband of top Clinton aide Huma Abedin. Trump leads Clinton by three points in Iowa, 44.3 percent to 41.3 percent according to an averaging of polls by Real Clear Politics. In two of three polls taken last month, Trump leads Clinton in double digits in South Dakota.